This isn't a news report. This isn't a place where you'll find new information or speculation on what happened or why. This is simply a moment to say that yesterday we lost a fashion legend. 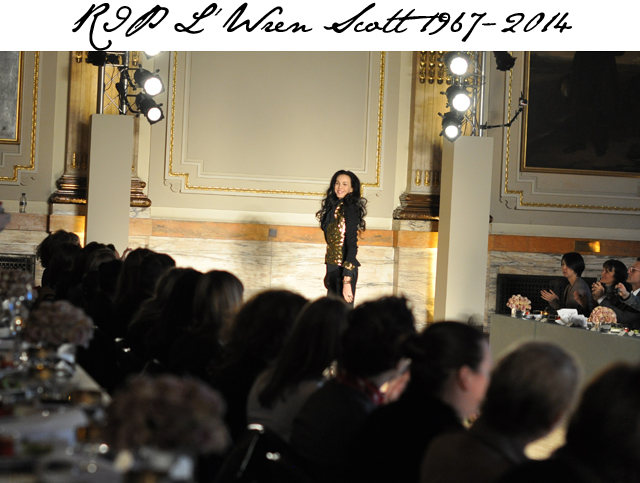 It was reported that fashion designer L'Wren Scott was found dead in her apartment in New York, late yesterday afternoon. The rest that is being said is pure speculation. We know no reasons for sure why she decided to leave us, we only know that as the day starts today, on March 18th 2014, Ms. L'Wren Scott is no longer with us. So we write this to take a moment to remember the beauty she brought to this world, the fabulous designs that graced the red carpet elite, the beautiful collaboration that was just completed with Banana Republic and the smile that lit up many events around the world.